Back after a very rough week and weekend. Here are links to some of the great freebies out there. • At Daily Science Fiction: "Superhero Art" by Cat Rambo. Superhero. "You're wondering: superheroes? Yes. Art was one. Genetically created by evil super-scientist Mondomania. And married to a second superhero, the living embodiment of Gaia. We all called her Maggie." • At Escape Pod: "Southpaw" by Bruce McAllister. Science Fiction. "Fidel stands on the pitcher’s mound, dazed. For an instant he doesn’t know where he is. It is a pitcher’s mound. It is a baseball diamond, and there is a woman—the woman he loves—out there in the stands with her beautiful blonde hair and her very American name waving to him, because she loves him, too. It is July. He is sure of this. It is ’51 or ’52." • At Mad Scientist Journal: "Monsters Behind the Scenes" by Kate Elizabeth. Science Fiction. "We humans are bombarded on a daily basis from telemarketers, door-to-door sales men, infomercials, advertisements … the list goes on. Tempting us to spend more money, change our electricity providers, get rich quick, and lose weight fast. But behind these companies and charities there is a hidden, supernatural, agenda." • At Short-Story.me: "Tiffany Blue Sunday" by Matthew Barbour. Horror. "There were three maybe four of them. When I saw them sneaking in, I grabbed my rifle from atop the mantle and hurried from my house to a position behind a boulder at the front of the mine. It wouldn’t take them long, maybe a minute or so for them to sort through my tailings or chip off a fragment of the turquoise that still clung to the walls. Then they would come out and slink off to their pueblo with prize in hand." • At The WiFiles: "Catches Burning" by Robin Dunn. "Joe’s flesh crisped, and his soul did something or other, perhaps leaving this universe, perhaps opting to stick around as an angry ghost, perhaps both. As the people threw more faggots on the fire, a fiddler struck up a tune and some of the couples took up dancing, slowly, holding each other tightly, rotating like human spits." • At Daily Science Fiction: "The Frog Prince" by Jonathan Vos Post. Fantasy. "So This Frog Goes Psst!" by Ed Kratz. Fantasy. "Hand in Glover" by Shawna Mayer. Horror. "Leave Note at the 7-Eleven" by Aiza Mohd. Science Fiction. "Sewing The Seeds" by Clint Wilson. Science Fiction. "Beaming Errors" by Duncan Shields. Science Fiction. • At Toasted Cake: "Zebedee the Giant Man" by Tina Connolly. Audio. Speculative Fiction. • At Author's Site: "Hunter Hunterson & Sons “Home” Part 1" by Scott Sigler. "Your favorite monster-hunting family returns for a new tale of rootin’-tootin’ supernatural mischief. As Hunter and his family settle into their new digs in San Francisco, they find out that their new mansion holds far more surprises than they would like." • At Drabblecast: "The Revelation of Morgan Stern" by Christie Yant. Horror. "It is July 31, your birthday, and I can’t reach you. I’ve been trying all day, but the cell networks are down, the internet is down. I even tried a pay phone–there are two left in town that I know of, and I collected all of my change and walked to the 76 in the village. It was on fire." And "Dear John" by Rachael K. Jones. • At Escape Pod: "Southpaw" by Bruce McAllister, read by bdoomed. Science Fiction. • At PodCastle: "The Wanderer King" by Alisa Alering, read by Amy Robinson. Fantasy. "We steer clear of the mines–that’s Fixer territory. The Wanderers are dangerous, too, ever since they came fighting back around Day 30. But there’s always been less of them–less in all, and less because they scatter through the woods on their business instead of fixing to the towns and mines." • At Pseudopod: "The Chair October" by Leah Thomas, read by Justin Riestra. "The spiraling piece of inner ear was almost the exact same shade of beige as the tablecloth his Great Aunt had given them at their wedding; Gwen couldn’t have expected him to spot it when he set down the jar of marmalade. She should have left the cochlea in her earhole where it belonged, but she had taken to removing it while she slept and only jamming it back into the side of her skull again moments before stumbling out the door on her way to the unemployment office." 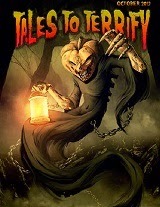 • At Tales to Terrify: "The Pumpkin Man" by John Everson, read by Stephen Kilpatrick. Horror. "After her father’s gruesome murder, Jenn needed a place to get away from it all with some friends, to take her mind off her grief. The empty seaside cottage she inherited seemed perfect."